This is a catalogue of the questions that have been put to Christine and her answers. There is some very valuable information here and interesting points brought up. Subjects in order of appearance. The Healing session; the space of Non doing. How did Kevin come to channel Angelic Reiki? Talking to the participant on a recent New Shamballa workshop, has made me realise that there may be a general misunderstanding regarding Angelic Reiki healing. In a healing session one simply connect in the way described in the manual under the section "Healing as a Channel". It is the not doing anything by the healer, except for connecting, that is the basis of Angelic Reiki. It is demonstrated by all recent scientific research, especially in the field of quantum physics, that we have an absolute effect on what manifests. Therefore any DOING, thoughts, desires or intention by the healer will interfere with the field of pure angelic energy that is present for the healing. It is the understanding of this principle of non-doing, which makes the statement by Metatron that Angelic Reiki is, "The Healing for Our Time", true. All healing methods described in the manual are not things to DO in a healing session. Everything will spontaneously arise as directed by the Angelic Kingdom as and when needed. The purpose of formally teaching the various healing methods within the workshop is so that the practitioner has awareness in their consciousness of what may arise. For example, if the over lighting Angelic energy prompted the healer to allow a third eye healing and the healer had no references for what was being asked, then they would not be able to facilitate it. OR if suddenly the reality of the room dropped away, or there was a significant change in energy when an Ascended Master energy became present for the healing, and the healer had no references for these, then it would probably throw the healer into the conscious mind which would be questioning what was happening. The healing methods as taught in the workshop are simply to place in the consciousness of the practitioner the various possibilities that may arise when prompted by the Angelic Kingdom. I understand that we don't have to think of symbols, hand positions etc (which I find quite liberating!) but don't we have to consciously 'hold the space'? When I give a treatment once I’ve called in my own healing angels and the clients' as well as the Ascended Masters I feel close to, I tend to back away and enjoy my own healing knowing full well that the clients' needs are taken of. Is this okay or should I remain totally focused on holding the person's aura for the angels to come through? I sometimes wonder if I'm being selfish by me enjoying this so much and may be I'm watering down the flow for the person because I'm getting it first! I don't mean it like that when I'm giving a treatment but I hope you can understand what I'm saying? Thank you for answering all these questions - it does clear many things up. Yes we do have to consciously hold the space, but what I am saying is that this is all we have to do. When we hold this space unconditional, without putting our personal attention on anything (except enjoying the energy) then the most perfect Angelic vibration or master energy will be there. The Divine knows exact is needed. We do not. It may be that a particular client's needs healing from a E.T. or psychic surgeon. This will occur if we simply hold the space. We have to realise that we do not know what is best. For healing it is not necessary for you to call in your own angels. These are for you. Absolutely just enjoyed the energy. In fact this is the most perfect thing to do as you share the space with your client. We do receive a healing as well as the client. 1. Let the client tell you what they want help with. This sets the intention. 2. Dedicate the space. Kevin and I say in our consciousness "I dedicate this space to the highest healing possible for.........." This is an essential step in the healing. It allows the vibration in the room to change allowing the Angelic Kingdom to manifest. It also energetically sets the intention. It is the step that takes care of all that needs to take place and spirit and the Angelic Kingdom respond accordingly. 3. Connect to the client as described in "Healing with the Intention" in the manual. 5. Disconnect as described in the manual. ESSENTIAL. When you are doing Angelic Reiki on a loved one who is dying what is the burst of such happiness and joy you feel inside as their spirit leaves the body? Thank you for your beautiful question. In the eyes of spirit what we call birth is death and what we call death is birth. When we as magnificent spiritual beings drop our consciousness into the physical realms we leave to some extent, the knowledge of what existence in spirit, our true self, and what that is really like. When we hold a healing space we are actually holding a connection to the Divine. This is the honour and service of being able to be with someone as they leave the incarnation. What you have experienced is truly how it is. It is the happiness and joy felt by the beings in spirit on welcome a loved one home. As we hold that space we too are touch by this happiness and joy as the Portal opens for them to leave the incarnation. I would also like to say at this point that the language that we use is so misleading. Yes somebody leaves the incarnation, they leave their physical body, BUT they do not go anywhere. The realms of spirit on all dimensions, are around us and with in us here and now. We had just forgotten how to feel and see it. Although it is not often seen in this way, it is a great privilege and blessing to hold the space when a loved one leaves the incarnation. Both my father's best friend (and my godfather) and my Aunt have cancer and are on hospice care. We've known for the last week that it was only a matter of time before they passed over. Last week, I received guidance that I was suppose to help them during the transition period. On Sunday, I did distance AR on my godfather. It was a profound experience with lots of pink light and him releasing some "black stuff' from his solar plexus chakra. On Wednesday, I developed a very bad cold. My guides advised me not to do any AR because of my weakened condition. I'm still dealing with the cold tonight. I just learned that both my godfather and my Aunt passed away this evening. I just tried to do distance AR for my Aunt, but had trouble holding the space and the angelic healing only lasted about 6 minutes. After the angel left my consciousness, I noticed that the healing continued with more pink and violet rays around the departing soul. It appeared that my Aunt is leaving through her heart chakra. I've read Kevin's article about the dying process. I think I can still help them over the next three days. If I did distance AR daily for the next few days, would that indeed help? If I'm still too weak to hold the space, can you suggest an alternative to AR to help them? Thank you for your email. It is lovely to hear from you and Kevin and I send you much Love. You sound to have had a beautiful experience and done a great service for both your Godfather and Aunt. Yes, absolutely you can help over the period of 3 days after the last breath. If fact one can do exactly the same service at anytime (even years) after the "death" as the 4th Dimension or Astral plane is out side of space and time as we know it. As well as the healing I suggest that you do the Archangel Michael Karma cutting Meditation on their behalf. (The one in the Angelic Reiki workbook that is done before the attunements, or the one on the website). Look after yourself. Know that when we give a healing, including a distance healing, we ourselves are also receiving a healing, and as you have discovered even if you cannot hold the space for very long the energy pours in for as long as is needed. I don't know of anything else that can do this service like Angelic Reiki, just send the healing when you can. Let holding the space be really easy. Just dedicate the space invoke the Angel or Angels and let go, don't try to do anything else. Do some self healing and at the same time just have the intention that the perfect energy also goes to your Godfather and Aunt. I'm contacting you as I have just heard from a friend in the states that the Angelic Reiki modality is now being offered via distance training from qualified teachers via webcam and skype. This is a course that I have longed to receive for a very long time now but due to suffering with Agoraphobia for the past 10 years which I am starting to get over now with the help of the Archangels and Energy healing I just wanted to ask is this true as I would love to learn Angelic Reiki but do not want to be studying something distantly that is not allowed. Thank you very much for your message and Kevin and I wish you a wonderful 2009. I am sorry to say that the information that you have been given is quite untrue. Kevin, as the Channel for the system from Archangel Metatron has always been quite clear that it is not possible to receive the full energies of the Angelic Reiki initiations through distance training. There are a number of reasons for this. When a group gathers together a vortex of energy is created. It is by being in this vortex that the changes to our lightbody, consciousness, DN A and molecular spin takes place facilitating the attunements. These attunements are an on going process, the integration continuing through out the whole duration of the course. Angelic Reiki training is a very practical experience. Part of the integration of the energy and the necessary experience as a healer is taught through seven healing methods that are practised and experienced during the training. It is only through practical experience that we can ground this energy and pass it on to others as a healer or as a teacher. Also as the group gathers together questions arise from that group. The information that is channelled specifically meets the needs of that group. We have found interaction between the participants is highly valuable. To give the workshop at a distance would not be honouring the energies and more importantly not honouring the recipient. It would be a misrepresentation of the training that we do. Although an important part of the Angelic Reiki training is also for self-healing it is possible to receive the full healing benefits either as hands on or as a distance healing. If you would like me to put you in touch with a local practitioner please let me know where you live. I would be very grateful if you would let us know who passed this information on to you. If there is a teacher who is teaching through web-cam and Skype they are not actually passing on Angelic Reiki. I know that Archangel Metatron has given us the Angelic Keys to the Reiki Symbols. But what exactly does it mean to experience them on all seven levels of form and Divine Form? Are those the seven Chakras? What exactly is form and what exactly is Divine Form? And are there seven levels of form, AND seven levels of Divine Form? Or are there just seven levels altogether (combined)? This is just for my Intellectual understanding, so that I know exactly what I'm talking about. The attunements are to seven levels of form and seven levels of Divine form. The rule of seven is a cosmic law. The divine manifests through seven rays or emanations. This is a Divine archetype and all creation mirrors this. This is why there are seven sacred planets in our solar system, why there are seven spiritual ashrams on the inner planes, and why you have seven chakras seven days of creation, and so on. All symbols can be interpreted through the seven levels of consciousness. Each symbol will carry a different energy depending at what level it is contacted. In the initiations of Angelic Reiki we ask for the symbols given to be activated through all seven levels of form and divine form so that the student has access to all the levels of consciousness on which those symbols can be contacted. When we look around us we think we see what is there, but even your computer has seven levels of manifestation. Modern science has indicated this. It is very difficult for us to get a sense of all the levels of manifestation and consciousness, especially in the higher spiritual realms. The Merkabah and Shamballa workshops (especially the Merkabah) allow us to understand the process of creation and manifestation through all of the 12 dimensions. "What is the difference between Angelic Reiki and traditional/Usui Reiki?" There is a "Core" (!) difference between Angelic Reiki and other forms of Reiki, and indeed many other forms of healing. It is simple and totally profound. In most forms of healings and attunements it is perceived that there is something TO DO. All DOING comes from personality and ego. All perception that there is something to do comes from the same place. In this space the FIRST RAY LAW of the "manifestation of the DIVINE WILL" is compromised. This why the Angels do the attunements and the healings and we just hold the space. This is why everyone reports that Angelic Reiki energy is different. The healing wisdom of Atlantis was held after the fall in Tibet. This is why the Reiki healing symbols were found in Sanskrit Sutras. The pure understanding and philosophy of Tibet is ZEN, non doing. Limitations which have been in place, limitations which echo those which were so selfishly employed by the Atlantian must now be been removed. This new form, this liberated and evolved, truer expression of Shamballa Energy must grow. Shamballa is the multi - dimensions element to the work which you do. It enables people’s consciousness not only to become empowered, not only to recognise their Divinity, but also to recognise their commonality, to become linked to the Whole. It repairs the damaged structure of the web. It weaves people’s consciousness back into the whole. It aligns them, through the grace of the Seraphim and the Cherubim, to come back into the Divine and all of Mankind and all of the Higher Spiritual powers that exist. The system that you also work with, The Angelic Reiki, is the tree trunk and the roots that allows the higher powers to be draw down into the Physical plane, and anchored into this World so that Mankind can survive and grow beyond that which they were. The Shamballic energy is the branches of the tree that enables greater communion and connection to exist to all other life forms and consciousness, to the Sun and the Air and the Water. It (Shamballa) connects the tree to all other trees from the higher perspective, where as the Angelic Reiki links the tree to forces of energy and consciousness below, completing the cosmic cycle. They are two ends of the scale they are reflections of each other, power and knowledge, wisdom and application, they are the balance of the elements co joined as one. There is more information on the Q & A's on our website www.angelicreikimagic.com Everyone is welcome to copy and use anything on our site. Please just credit the source. If you want any further clarification please don't hesitate to send me an email. I've just completed my Master course and raised a question with my teacher as to whether there is a minimum age limit for attunements and she suggested that I contact you. My son is 14 in November, he is very 'sensitive', has already been attuned to Usui Tibetan level 1 and is soon going to do his level 2. I feel very strongly that he could be attuned with Angelic Reiki as I know he would love to work at a higher vibrational level. A friend of mine is running Teen Healer workshops and is attuning teenagers to Usui Reiki, she is finding this very successful, the participants are finding it transformational too and it seems to be helping them with all the associated problems of puberty, school, exam stress etc. I wonder how you feel about running Angelic Reiki workshops for teenagers. Thank you very much the question. There is absolutely no age limit on when somebody can be attuned to Angelic Reiki. The Angelic kingdom is a beautiful energy for everyone at all ages to work with. There are though two important practical considerations. Firstly that the child is old enough to feel happy to sit in the workshop for the full length of time (for a Angelic Reiki 1 & 2 workshop this is in total 18 hours), and that they are of an age to appreciate and understand the information that is given. Secondly that it is the child's request to take the workshop understanding fully the purpose of doing so. There is an assumption that it is better in some way to receive the attunements, but for many children they receive all that they need in terms of connection to the angelic realms, through receiving healings. I would therefore say generally that the appropriate age to do a workshop for most children would be in their middle to late teens. It may be that they shun the energy until the experience their Saturn return in their 20s. Trust this helps and answers your question. I was wondering if you could help me. If I give someone Angelic Reiki can this have an affect on heart eg the heart beat/rhythm of the heart. I have been giving my father Angelic Reiki since March and recently he has been passing out and the Doctors have said he has an irregular heart beat. They still have to do more tests as they are still not sure what is causing it. Could this have been caused by Angelic Reiki changing the heart beat or is it just something that happens. My father is now 86 years old. If Angelic Reiki can change the rhythm of the heart what can I do? I just love giving Angelic Reiki. The people I have given it to who have already had Usui Reiki have said that they can certainly feel the difference and also said it is very powerful. Love and Angel Blessings to you both. From our long tradition of drug medicines we have got used to the idea of cause and effect. We can not carry these paradigms over to Angelic Reiki. In workshops I often described the healing space as an "invitation". By this I mean that the space that we hold during a healing is an invitation for the receiver to recognize their own Divinity. So in the literal sense Angelic Reiki cannot cause anything. If the change in your fathers heartbeat is due to a change in consciousness as a response to this invitation by the Divine, then in one sense one could say that Angelic Reiki was the catalyst, but I do not feel that this is what is happening here. As we say in the workshops symptoms thrown off by the body due to a change in consciousness our simply our physiology read justing. One of the graces of Angelic Reiki is that we as a healer do nothing except dedicate the space and hand everything over to the divine as expressed through the angelic kingdom. The angelic kingdom is perfect love. Angelic Reiki can do absolutely nothing that is contrary to your father's soul's purpose. My feeling is that the heart symptoms are not due to you giving the healings and that it is of service to continue. I feel guided to reply to you regarding Kathlyn's question. Having experienced severe palpitations myself and done a "journey" with a particular pharmaceutical drug, I wish if I may add this to the mix of energy I feel coming in through this question. Although I know on one level my physical heart and it's energies were being reattuned to the primal cosmic rhythm, I also know through my research (being a nutritionist), that heart palpitations can usually be linked, on a physical level to a lack, often a severe lack or depletion of magnesium. Interestingly, certain if not many pharmaceutical drugs, especially central nervous system depressants (tranquilizers) when taken, can result in this severe depletion. If I may humbly suggest, it might be prudent for Kathlyn to check out the drugs her father may be taking (if any), and or ask for guidance on him taking magnesium supplements. If there is an "energetic" way of doing this, I myself would be interested in knowing how to do this. Sending you a bucket of blessings and again thanks for the wonderful workshop in Toronto!! I thank you very much for this. Kevin and I feel that it is very important that in order to be of the greatest service as a healer the need for good nutrition needs to be recognized. We anticipate that in the future part of Angelic Reiki training will incorporate anatomy and physiology and nutrition. This will not be in terms of a qualification, simply awareness so that professional advice in the area of nutrition will be recommended where appropriate. We are in physical bodies and they need the appropriate foods. I feel the area of giving nutrition on an energetic level needs some research. Yes it is possible, but to maintain good health I feel that nothing can replace good food and appropriate nutritional supplements. By good food I mean a diet that creates an alkaline balance in the body. Thank you again for you message. First of all, I want to thank you so much for being able to bring Angelic Reiki on to this Earth. After I completed my Angelic Reiki masters, I have been taken abroad to the East side of the world and have been working as an English teacher, from this I have found that people here need a lot of healing and direction as everything appears to be very materialistic and a lot of covered up sadness and insecurity. The thing is, how can I get Angelic Reiki out there? How can I heal people? I want to increase my energy levels to the extent that I am able to heal people in my presence (I hope that’s not too big-headed) and make them happy? I have not used A. Reiki for over a year now and even though I see the lights, I sometimes doubt my ability. Thank you for your e-mail and it is nice to be in touch with you. Have you done Angelic Reiki 1 & 2 or the Master class (3 & 4)? I would also be really interested to know who taught your classes and where you took them. The most important thing about Angelic Reiki is the concept that "the healer" does not do anything and it does not matter what the healer's energy is for Angelic Reiki to work. It is simply about following the steps that are laid down in the manual. Dedicating the space, connecting with hands and feeling body/auric body (same thing) and invoking the Angelic energy, THEN simply holding the space and not doing anything. When we, "the healer", do anything, or think that we have any part to play then this blocks the flow of the angelic energy. Our intention must be to hold as unconditional space as possible. If you have been attuned to Angelic Reiki you are already healing people that are in your presence. It is important to remember that the Angelic energy is simply an "invitation" for that person to heal and change. A lot of people in the general public are totally happy and satisfied with where they are and there is no desire to change. We must unconditionally allow them to walk the path that they have chosen. Again one of the fundamental principles of Angelic Reiki is unconditionally. We need to accept everyone exactly as they are and know that is perfect for them. The only person we can take any responsibility (or even desire) for is ourselves. Part of being an Angelic Reiki person is a commitment to our own path and indeed one of the main purposes of this method of healing, is to heal OURSELVES and support ourselves through the changes that we are all experiencing at this time. I feel that I can add something important to the answer that I gave yesterday in answer to your question. I believe that when you say you wish to build your own energy it is coming from the Eastern philosophies of working with Chi (Ki/Prana/Mana; all different terms for the same energy). Chi is the life force energy that is given off and take in by everything. Our principal sources of Chi is from the Sun and the earth, and by various practices like Chi Kung individuals can build their own levels of energy and enhance our power. (For those of you reading this who have done a workshop with Kevin and I recently, working with Chi is the way that we keep our etheric body healthy.) It is Chi energy, or prana, from the planet that is used in "magnetic healing". Magnetic healing is the healing that is done through physical contact with our hands. (Hands on healing). This is the most common type of healing. In Angelic Reiki we also connect with our feeling body / Aura / consciousness. When we energetically embraced the person who is receiving the healing with our own consciousness and allow this to merge into one field of energy, and then invoke the most perfect angelic energy for the healing, we are doing what is now as "Radiate Healing". Radiatory healing does not involve our own energy levels at all. We are simply holding a space in consciousness which is infused by the angelic vibration that we have invoked. The angelic energy that is present is the most perfect for the person who is receiving. It is the energy that is brought by the angelic kingdom and thus is more perfect than you or I could ever create, or even imagine. Because in Angelic Reiki the angelic energy totally over lights / takes over the healing space, it is also the angelic energy rather than earth Chi that flows down our arms as "magnetic healing". This is why our own personal energy is not of paramount importance when doing Angelic Reiki. It is though, a positive thing for the healer to be energised as it helps us to keep the focus for the healing. It is this combination of magnetic and radiatory healing that makes it possible to "heal" someone on every level physical ,emotional, mental, spiritual and Soul, and most wonderfully of all it is done by the perfect divine presence of the Angelic Kingdom. An in depth understanding of healing can be found in "Esoteric Healing" by Alice Bailey(channelled from Djwhal Khul ). Lucies Press. I hope this gives a full explanation of the process involved in Angelic Reiki healing. Thank you for sending this. It is great to watch. Just to add something though. It tells only one part of the story as there are seven fundamental platonic solids, not just the star tetrahedron, that create different Merkabahs at different levels of consciousness, one for each chakra. There has to be seven as this is the creative number: seven days of creation etc. A Merkabah is creative consciousness, it is angelic. 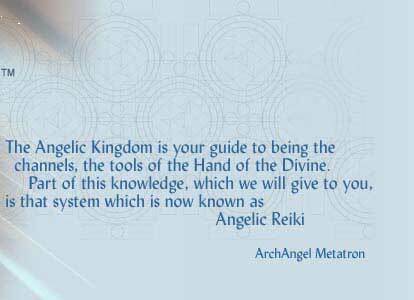 It is the knowledge of the Merkabah that enables us to deeply understand the creative principles behind Angelic Reiki and the angelic kingdom. In the Masters 3 & 4 training we are taught the "healing eye" method of healing. Why would it be relevant? I must admit, apart from having done it during my training, I have never had to use that healing method. To me it seems slightly "devious" to send someone healing in that manner. Would it not be ideal to give someone when they ask for it - just a straight forward session? Why would we need to give the "healing eye" healing? Or otherwise if that person has expressed a desire to having change in their life (whether or not they know it consciously), would we not send them distance healing instead? Some people obviously are not necessarily open to receiving healing, could be for whatever reason (maybe a deep set belief system, that could deprive them of that opportunity). I could see using the "healing eye" method for that, but that would seem devious. Also in the Usui system ( when I used to teach it). We taught our students to ask for permission first, either in person or from the Higher Self of the person, if doing distance healing. I don't remember ever learning that in Angelic Reiki. I've been sending Angelic Reiki to everyone I sense needs healing...this should not be a problem? My sense is that I am not interfering with their life path and process , as the Angels and Higher Guides are doing the healing anyway. What do you think? Any clarity that you can provide would be greatly appreciated. Thank you very much for your question it is a very important one. I am sorry that it may be quite a long answer but the information here, I believe, is exceedingly important. It is absolutely true that in Angelic Reiki we do teach that it is NOT necessary to ask permission to send a distance healing, or an "Eye Healing". The reason for it not be necessary to ask to send a distance healing is exactly the same that makes it NOT "devious" or intrusive to send an "Eye Healing". In a way the word "Healing", is not an appropriate word to use in Angelic Reiki, because of the implications of the meaning of the word through recent usage. Usually the word healing is used when it is perceived that there is something "wrong" with someone and they need to receive energy to change or improve things for them. This is not the definition of healing in Angelic Reiki. It is important to see everyone as already Divine, and perfect; which is the truth. An Angelic Reiki "healing", is simply about holding an unconditional space, totally infused with the energy divine perfection, the angelic realms, as an invitation for that person to recognize their own perfection and divinity in that moment. In an Angelic Reiki healing we do not perceive that there is anything to "DO". If there is nothing to do everything must be perfect now. As someone connects with their own soul or Higher self there is no room for anything that is not perfect. (See Djwhal Khul's laws of healing, LAW 1 in the students 1 and 2 work book). Sometimes concerns about the eye healing do come up and this is often due to pastlife memories. Sending energy through eye contact has in the past and is now being misused. One of the purposes of teaching this method of healing is to clear the misuse and bring back the higher pure potential of this method of human contact. In the past it was used in Egypt by the priests to program those in power to do their will. Today it is used by advertisers. When there is a TV advert with a full eye contact there is the possibility to send a subliminal message to the consumer. Eye healing was used in Atlantis and other ancient civilisations. It is a way to contact people's past lives and Soul. As you can feel in the eye healing practice it is a beautiful and honouring space to gaze into someone's eyes. When sending a healing in everyday practice, a simple glance is sufficient. All Angelic Reiki healing can be seen as an invitation or blessing. If you are walking down the street and see someone that touches your heart, spontaneously a pulse of love is transmitted to that person. We do not ask permission to send this love, and indeed it would be impossible to do so as it is a natural and spontaneous reaction. Sending an Angelic Blessing or healing is the same as this. How beautiful to be able to send unconditional Angelic energy will be glanced into someone's eyes. On a more practical level eye healing can be used in situations where it would not be possible to do a hands on session and yes distance healing would may also be appropriate, but the eye healing process gives us the opportunity to build energy over a period of time. An example would be to allow the Angels to program a sphere for 7 to 10 days (whatever time feels right for you) for a teenager who is going through a difficult time, or a rebellious seven-year-old who is having problems at school, or a person in the office who is obviously struggling. It is not devious, it is simply a way of transmitting an Angelic Blessing of Love, and an invitation to that person to start to recognize the truth of their own divinity, beauty and power. .I don't like the [eye] thing it reminds of this gypsy movie where she used the evil eye on people to bring them bad luck and harm. I like the hands on or human touch. Yes, the Eye Healing does remind us of the lots of ways in which this method of transmitting energy has been abused. As I said in the last Q & A, one of the purposes of it being included in Angelic Reiki is for us to heal in ourselves and in the human collective consciousness the energy of that misuse, move past it and embrace this method of healing in its most beautiful and loving way that deeply touches the soul of the receiver. I have been giving Angelic Reiki distance healing to my son who takes recreation drugs. He is much too jittery to give hands on healing to. I did ask him if he wanted it, he didn't say no so I thought I'd have a go and requested any unwanted healing to be returned and sent back into the earth. On the morning of 1 November at 8.30am when I just about to leave for my angelic reiki 3&4 masters, he came round to my house in tears and said he had "had enough of drugs" He asked what could be done, I said I could give some healing, but at the time he said he could only cope with a mother's hug! I feel it will take a bit of time for the adjustment of leaving that life behind so I will continue the distant healing until such time as he can accept hands on healing if he wants it. I also visualise him being well and in Archangel Zadkiel's violet flame of transmutation and Archangel Michael protecting him. The intention is that healing is for the highest good anyway. I have sent this question to Kevin but then I got your email if we had any questions so please forgive the duplication! I am having a big problem with feeling 'worthy' enough now I am at 'master' level. I was great with Levels 1 and 2 and could feel the energy beautifully and different people said how relaxed they felt etc but now, after doing my masters I feel flat. It seems that people are walking away disappointed in what they are feeling and I can't seem to get that gorgeous feeling back when I call in my healing angels (I know they are still there but I feel I'm a disappointment to them because of the way I am feeling - does this make sense?). I know I am utterly wrong in the way I am thinking but I can't help but think why would these beautiful angels want me to become a channel for their energy when I think of myself in such negative ways. I've never done anything particularly bad but growing up my Mum would use the fact that we couldn't receive Jesus in Holy Communion (I'm Catholic so good old Catholic guilt!!) if we had 'sinned'. I don't know if I'm just still feeling those repercussions? Pleas tell me what I can do as I really miss the feeling. Thank you very much for sharing this with me as it gives me the opportunity to send out some very important information. Something that is not often mentioned in workshops is that Angelic Reiki was given primarily for self-healing and to support light workers through the changes that are happening at this time. What has happened here is that the Masters 3 & 4 workshop has brought to the surface personal issues that are there and need to be addressed at this time. The wise part of you, that guide you to do this workshop, knew that the primary reason was for your own personal journey. Angelic energy is not always soothing, and relaxing. It is sometimes disruptive. Angelic Reiki brings in the angelic energy which is unconditional and in the Divine Perfection. It therefore brings to the surface anything within each of us that is not in divine perfection and that we need to address as one of the lessons/opportunities that our soul has chosen for this lifetime. Recent spiritual thinking that has led us to believe that we should be living lives of love and light and happiness has done us a great DISSERVICE. It can be a rough and rugged road walking the spiritual path, facing all of the self doubt and feelings of unworthiness. What is facing you is one of the main spiritual challenges on the path to recognizing who you really are. The Masters workshop has been of great service to you in presenting you with the opportunity to now work through major issues on the spiritual path. As Angelic Reiki practitioners and teachers our primary concern is our own healing path. We cannot serve others if we do not serve ourselves first. Sometimes it means that we have got to take time out to do our own personal healing and this is exactly what Kevin has had to do over the last year so. It is therefore very important to do self-healing and to embrace whatever healing modalities that are most going to supporter each you. If it was not for our many resources of healing tools Kevin and I certainly would not have got through the last two years. We use our Merkabah Medication (workshops coming up in the UK and USA soon) to balance our emotional body and remove negative programming, we used the Shamballa energy to bring in acceptance, Unconditional Love and the spiritual Warrior energy needed to walk this path, (again Workshops in the UK and USA in 2009) Homoeopathy for physical and emotional healing, (there are many excellent professional homoeopaths around) and SRT (Soul Recreation Therapy, which I do as a distance clearing) to clear past life and soul karmic issues. The right tools for you will present themselves, just go where your heart leads you. I congratulate you on coming to this place on your spiritual journey. The question is please define "soul group." The first thing that I need to point out is that our human minds do not have the references to enable us to accurately understand the nature of soul. To do our best to understand spiritual things, humanity has always used symbolic references, e.g. pictures of people with wings to represent angelic energy. So the way in which I am going to illustrate what is soul group, or family is, IS NOT exactly true, it is simply about using concepts that we do understand to try and convey a concept that we can only intuit. God, The Divine, Source, Infinite Possibilities, call it what you will, is an infinite field of potential that is located in no specific place. The nature of this infinite field of possibilities is an innate desire to create. The only thing it can create is a reflection of itself, because that is all that is known. This creates a reflection. (Sorry this is all very esoteric and only really understandable if you've done the Merkabah workshop). That reflection reflects itself again and again, and some of the process continues. At this point Source simply knows itself and it is the infinite presence. At a point in this process of creation that is created sees itself and recognizes itself as “something”. This is the point where individuation occurs and there is a recognition (although not really true) of something that can be named. In terms of our own differentiation from source this first unit is called the Monad. There are 144,000 aspects to this Monad each of which is a soul group, or soul family. Each soul family has 12 aspects to it, you are one aspect. Imagine it rather like a flower with 12 petals. The other aspects may be in incarnation here or somewhere else, or not in incarnation. The soul family is like a greater aspects of the self. The member of the soul family that we can get on with most easily is your soul mate as that is the soul aspect that is most like you and is next to you if you imagine the 12 petals flower. Contrary to popular opinion the most difficult person to get on with is your twin flame, because they are the opposite aspect of you. When I went to Tibet in about 1998 and visited a monastery just outside Lhasa, I absolutely knew that I had been a young monk there when the Chinese invaded Tibet in 1958/9; but actually I had been at school in the UK. I hope that this helps, but feel it for yourself and use your own intuition. I had my first angelic reiki paying customer today. I thought the healing went quite well on my part - I thought it was a lovely energy. When it was complete, I asked the lady how she felt and she said my chair was a bit uncomfy. I will sort the chair out and will try to get a therapy table or decent chair. However, she said she also felt a bit sick towards the end of the healing session. I feel it is a form of release - what do you think - (from the angels point of view (as I had asked them after) she had healing for her highest good). I also explained healing goes on for 21-28 days. I had warned her beforehand that it can sometimes bring things to the surface/release things and it may be that she may feel some this or emotional. I told her to take it easy for the day. Perhaps If I warn them about this, will it attract it? Please let me have your thoughts/advice. First of all I want to say that Kevin and I do very strongly recommend that when doing a professional healing to used a therapy table/couch. The person receiving the healing can only totally let go if they are laid down and this is an important part of the healing. Yes it is appropriate to point out that someone may feel symptoms of cleansing, either during or after the healing. Other feelings might be of discomfort in the limbs, especially in the areas of the joints where blocked energy is starting to move. Pointing this out can be important information for the client and definitely does not create it. We need to feel what information needs to be given before the healing for each individual client, but if someone is new to healing then cleansing symptoms are important to explain. One of the things that we as human beings are exceedingly well trained in is having an opinion; comparing, assessing, evaluating etc. Not only are we trained from being very young in his particular skills, we can actually take specialist courses in it. For Angelic Reiki these human habits have no place. If we do not get involved, setting up anticipations, expected outcomes, agendas etc: if we really do not get involved there is an absolute 100% guarantee that every healing, what ever happens, is absolutely perfect. Another aspect of the totally unconditional space that we hold for a Angelic Reiki healing, is that when the person leaves after the consultation, we also let them go in consciousness. We do not wonder how they are doing, is the healing working? Are they feeling better?. If the healing is in the hands of the divine, which it is when the angelic energy totally merges with us, then what ever happens after the healing is perfect. In holding that person in consciousness and wondering how they are is not embracing that everything is okay, that everything is exactly as it needed to be, that the angelic kingdom is in charge not us. Yes there may be some situations where we need to think about the client afterwards, but not to wonder how the healing went. Please read the most recent posting on the Angelic Reiki Yahoo group which talks about good and evil. Also the message posted on 28th October. We are not here to do good or to channel nice energy. We are here to find the middle space between what we judge is good and what we judge is evil. We, as healers, as a human incarnation, absolutely do not have the facilities to make a value assessment of healing energy or the results. This unconditional space is one of the basic tenants of Angelic Reiki. Christine, I am giving therapies to 4 people and after each healing I ask them how they feel and all of them have answered that they feel sick and feel their heads too heavy. None of them have told me they feel fine. Is this normal? What can I recommend these people to do? This is something that happens when people first start to do Angelic Reiki. It is a change that you need to make; there is no advice for the client. My guess is that you are trying very hard to do your best for your clients, and that you would like them to have a wonderful experience and benefit from the healing. Is any of this true? This is how we have been taught and it is very deeply conditioned in us, but the pitfall here is desire. We really do have to teach ourselves a whole load of new rules. In truth these are the rules of unconditional love, this is the essence of that that we call Shamballa. Unconditional love means of love without conditions. Don't try to do anything. Don't try to make them better. Don't even hope that they will get better. If you have a hope that they will get better that must mean that you are seeing them as not being perfect now. Don't wonder how they are doing after the healing. If you wonder if they are getting better after the healing then this must mean that you do not believe that the divine is in charge. I hope this helps. The unconditional space of unconditional love is actually the opposite to much that we have been taught and does need some practice and re thinking. IS it OK if I get my 1&2 students to do the affirmations before coming to the course? The reason I say this is because a student of mine has had problems with people whose energy has not been that clear and she has asked them to do these before coming along. I know I have mentioned this before to you and you think that they should not be given out before the course but I just think that people will be coming to the workshop much clearer if they have said these and it would help everyone – especially when the healing takes place. Also, surely if they do not resonate with what is being said in the affirmations then angelic reiki is not really for them. I would really appreciate your comments on this as I know that I always used to ask people to say these before coming but then retracted this when you said you did not recommend this. In our experience virtually nobody has a proper understanding as to the background and reasons for doing the non interference affirmations. Indeed it is part of this planet's history that is not understood. In our experience only about one person in 20 that attend workshops have read or and have any idea about the background to these affirmations. Therefore the vast majority of people are being asked to do something for which they have absolutely no understanding. This isn't to say that it won't work, but I am not sure that it is okay to ask people to do something totally blind. It is absolutely not true that if these affirmations do not resonate then Angelic Reiki is not for them. One could argue exactly the opposite. If these affirmations do not resonate with someone this may be because they are only experiencing a very small amount of interference, therefore they do not feel it is appropriate. This person it could be said to be working more with the light. I really do not think that the "stuff" that these affirmations clear is the cause for people's energy not being balanced at the start of the workshop. It is much more likely to be due to their own personal belief systems or that they have given their power away to previous teachers, especially any teacher who is doing attunement from Ego. This can happen to some extent in any attunement that is done through the consciousness of the teacher. The much more important thing is to make sure that people appreciate the energy that they are going to be working with before the workshop, and that the teacher must be very aware of any allopathic drugs that that person is taking especially antidepressants etc. At the bottom of this message is the e-mail that Kevin and I send out to everyone before they take the workshop. The non interference affirmations are not part of the Angelic Reiki workshop. They are an optional extra put in just three years ago because of requests from a particular workshop group. It is important not to undervalue the power of the clearing meditation that is done before each attunement in the Angelic Reiki workshop these are an essential part of the workshop and specifically designed to clear everything that someone is willing to let go of in that moment PERFECTLY in preparation for the attunement. The affirmation will not clear most of the main "stuff" that people bring to workshops. It is also important not to judge or assume that because you or someone you have taught has experienced a very powerful response to these affirmations, that they are indeed appropriate for everyone. In fact they do not work for everyone. It is also important that we accept people on our workshops with their stuff. None of us are squeaky clean and we are embracing Angelic Reiki with the purpose of moving beyond our stuff. There are of course exceptions to this and each teacher needs to use their own discernment. The only absolute guidance that Kevin and I can give is that if someone is on mind altering allopathic medication, e.g. antidepressants or antipsychotic drugs, then do not accept them on your workshop with out first personally talking to them and getting a feel for whether the energy will support them or not. Allopathic drugs block our conscious connection with the painful events that created the pathology in the first place. The energy of Angelic Reiki brings up everything that we need to look at. If someone is on antidepressants etc there is part of them that has made a choice not to look at the causation event. Sometimes people are willing to move past that, but other times not. If they are not willing to look at the cause then we are doing them absolutely no service at all by welcoming them on a workshop where the will experience an energy which is going to take them to where they had made a choice that they do not want to go. The situation of having to decline someone's application to attend a workshop is very rare. I have found that through talking the issues through with each individual case that they have experienced the workshop as a supportive and uplifting experience. It is really important, and in fact the essence of Angelic Reiki, that we are absolutely without opinion and judgement. This is very difficult as we are brought up in the West to constantly be "assessing" through comparison with other events and experiences, the value of what we do. We cannot even go shopping round a supermarket without doing the process of comparison and judgement! There is nothing "wrong" in sending out the affirmations, but they are not part of the energy of Angelic Reiki. As you know Kevin and I really try to resist putting out constraints or rules. The clearing that is done before each attunement is adequate and designed specifically to prepare each person to receive the attitude. If there is an incomplete clearing this is because the person is not willing to let go of the attachments. They may not be totally consciously aware of them. This is something that the teacher needs to deal with as it arises in the class, and each case is different. I would like to add that as teachers we are not responsible for the experiences of our students. We are concerned with empowering each person to take responsibility for their own journey. Just a quick couple of lines to clarify that the non interference affirmations are not part of the Angelic Reiki workshop. They are a optional extra. In the Angelic Reiki 1 & 2 part of our seven-day workshop, Kevin and I rarely find that we need to mention them. In the 3 & 4 and master teachers part we do mention them because they are in the work book, but one does not have to. We only take up time in the workshops to cover this if it feels particularly appropriate for that group, or it has come up is a specific question. Even then we do not usually to take time out of the workshop to do the affirmations. We usually give the information and background about these affirmations and then suggest that if anyone in the group feels they are appropriate for them, and that they personally do them, either on their own or with other people. We recommend that the affirmations are done three times with at least a three-month gap between each time they are done. Totally go with your own guidance and the needs of your group. You are all totally welcome to copy and use this, or take parts of it and adapted as you feel. During the spring of 2007, the energy of Angelic Reiki went through a transition and was experienced by the workshop participants in a more pure and potent way. This divine energy, by its very nature, creates balance; thus searching out everything within our consciousness, physically, emotionally and spiritually, that compromises us embracing the truth of our own divinity. As you may have realized from the web site, our teachings and practices are based on The Ancient Wisdom. In the ancient times, "students" had to commit to a time of preparation before receiving initiation. Today, with the fast pace with which everything is moving, it is not appropriate to do as Pythagoras for example did . . . asking his students to be in silence for three years before entering his school. We therefore just ask you to hold in your consciousness the sacredness of the work we are to do. This includes embracing all personal changes and clearings that will present themselves to you in the time running up to the workshop. People do experience, to varying degrees of intensity, physical, emotional and spiritual clearings. If any of these clearings present a problem to you, please contact me and I will do whatever I can to support you and give you an insight into the process. Because of the cleansing purity of the energy that is now contacted in Angelic Reiki, we have been shown by past experience that it is important that our participants advise us if they are at the present, or in the past, taking any prescribed psychotic medication (for example antidepressants) or have had problems with alcohol or drugs. We give no specific advice as to diet or lifestyle leading up to the workshop, but just ask you to be open to your own guidance and embrace what ever feels right for you. Please reply to this e-mail in order to let me know that you appreciate and embrace what we have been guided to pass out to all our students. I was very interested to read your reply to Jayn-Lee. I am delighted to have taken part in the Angelic Reiki 1 & 2 workshop with Jayn- Lee, who was an excellent teacher and am amazing person who I feel privileged to have met. I found the course profoundly life-enhancing and the clearing meditations and attunements were very powerful. I do not feel qualified to enter the debate on non-interference affirmations, or when they should be done, as I really do not know enough about them, apart from having said them out loud as instructed. However, I am in total agreement with your opinion on the use of anti-depressants. A large part of my work to date has been as a spiritual life-coach and healer. I never cease to be amazed at the number of clients who come to me having been prescribed anti-depressants without any consideration by their doctor of the root causes of their distress/anxiety. I do not feel this is always a choice that has been made by the patient and that they personally are necessarily denying the cause themselves, but that the causes, often very deep-rooted in the sub-conscious, have not been properly investigated and therefore they have not been given the chance to acknowledge them and thus work through them. Through tuning in to their psyche's and exposing the possible causes, I am therefore able to bring them to the surface and help them to face them head on and restore balance and harmony. Several clients have even been able to stop taking their medication following our sessions and having consulted their doctors. I was guided to take the Angelic Reiki 1 & 2 and I know this will be a powerful healing tool and will greatly enrich my spiritual work. I am so grateful to you and Kevin for having revealed it to us all. Kevin and I believe it is excellent information and exactly where humanity is now. The invitation is to absolutely not go into fear. This opportunity to allow the light to shine in the darkest places has never been so great for hundreds of thousands of years. This is the reason that you came to this planet at this time and it is up to each of us to make our own personal decision as to which way our paths will unfold in the next three years. We can do it joyously embracing and utilising the divine power that we have or we can struggle. Do you want to take the high road or the low road? The choice is ours. As a powerful resource we are offering the New Shamballa workshop which was designed and given by the Divine Hierarchy exactly for this time. There are already two of these workshops arranged for the spring. The first is from Saturday 7th to 11th March in North London and the second is 25th to 29th March held in Harrogate North Yorkshire. I would also like to share with you some information that Edwin Courtenay Channelled for Kevin and I. If we do not find now the tools and understanding to carry us forwards we could experience 2009 as a challenging time. For further information about New Shamballa please go to www.newshamballa.com or send me a note via the contacts page and I will forward to you information about the workshop. This workshop is open to anyone whether they have done Angelic Reiki or not. So if you know anyone who is having a hard time, or you think may be interested please feel free to pass on the information. Q. What is the role of Shamballa in the work that Christine and I have to do? I've asked the angels to help me as I had felt a bit fearful of how/if I would ever pull it off and they say the key is preparation and if I am going to do it, to get all the right bits etc and take the time to get it right and surrender any fear/control. I feel more confident now. It will happen in divine timing. Also, as a representative of angelic reiki, I feel I must try to do things to the best of my ability, although without ego, control but with love. We get a lot of messages expressing apprehension of some sort or another before teaching the workshop. We get a second e-mail saying how easy, wonderful and magical it was and how everyone thought it was amazing. Absolutely right, do the practical preparation, which grounds your intention, then let go. As it is all down to intention, those who desire to do their best for the highest energies of Angelic Reiki because this is whatto happen. Just "open up the space", committing the whole workshop to the highest Angelic Energies and have fun. I have been asked by a student how Kevin came to be the channel for the Angelic Reiki system? I don't recall seeing any info anywhere that would answer that question. I am really pleased that you have sent these questions as no one has asked any after the Christmas break. All the feedback that I am getting is that everybody finds the Q & A really helpful. So everyone, if you have a question please don't hesitate to forward it on to me, you are supporting everybody. All the questions that come have been asked before, but I am finding that in the Q & A situation I am getting new answers and new perspectives and answering in a different way. Before I can answer this question I have to set out a couple of points. 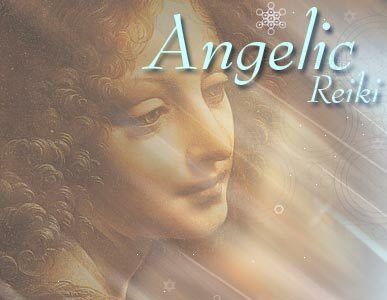 First that there is more to Angelic Reiki than first meets the eye, and indeed Kevin and I are perceiving deeper and deeper levels of the magic and ancient wisdom that is woven together to create this unique system. I often use the analogy of Angelic Reiki being like a cake. None of the ingredients are new, just like the flour that one might use, it is the same flour as anybody can buy, but what makes a special cake is the choice of ingredients that are mixed together, the quality of those ingredients, and how they are prepared. It is the skill of the cook that make something special. To continue this analogy we need to also look at the process of channelling. Although it is not often realized, even by the channel, it is impossible to receive and process through the conscious brain any information from spirit for which the channel does not have a reference. All levels of our consciousness are the conduit through which channelled information is received, this includes human consciousness. If the channel does not have references to make sense of the information then it cannot be relayed. There is no point in spirit giving me any information about nuclear physic, but perhaps Lee Carole could channel this. Kevin had recall of pastlife wisdom that was needed, had very widely read esoteric books in this lifetime, and had a deep understanding of what most people found difficult, also he has experienced extremely powerful personal initiations in this lifetime. He was reading Greek philosophy instead of playing football at the age of 12. He had all the resources, wisdom and information that spirit needed to create this cake called Angelic Reiki. He gave up his ordinary job, which on the face of it he absolutely could not afford to do, and for nine months just followed the prompting of spirit. His lifelong guide is Djwhal Khul, the master of the Second Ray, Love/ Wisdom, the ray of healing. He was guided by Djwhul Khul to obscure books in the library, etc. Over those months information and guidance came to him from numerous different souses; he was phoned by friends who had been told to give the Master attunement in Usui and Shamballa Reiki (he was already an experienced intuitive healer and did not need these attunements to be a healer). He did not know why all this was happening but at the end he was shown that it was a healing system. It is only when you know him as well as I do that one realises the incredible knowledge and clear perception that he has. He came to do this job. Another essential aspect was him and I coming together, uniting the male and female and twin flames. 1) Who / what are the Council of Ain? 2) Many of the names are seemingly Hebrew, especially in the amazing final attunements at the end of Level 1&2 attunements linked to Quabalah but not / other sacred texts - why is this? Some of the questions asked are really very deep and can only be completely answered through one of the other workshops the Kevin and I teach. It would really take me a full seven days to answer this properly. I will do my best! As you have probably realised both questions are connected. The attunements are done through all seven sacred languages, but one language had to be chosen to be used and yes it is ancient Hebrew. All Reiki and any teaching or attunements are takes us from the illusion of separation and towards the knowledge of our divine selves, come from high Atlantean wisdom. This is because this is our lineage and history. When Atlantis fell, both in consciousness and physically, and people started to use the knowledge, wisdom and power that they had for personal gain, the truth was preserved and held in specific places on the earth. The two main ones that we are concerned about are Egypt and Tibet. Egypt has always been a great centre of learning and all great teachers including Pythagoras and Sananda went there to study and to take spiritual initiations. One of the earliest of these initiates that we know of is Moses who took this knowledge and created the foundation of the wisdom that we today known as the Quabalah, (Kabalah) and the book of Wisdom known as the Torah. As man fell more and more into ego and separation this wisdom was kept secret because of its power. The tarot cards that we use today are our most visible connection to the ancient wisdom of archetypes (angels), and as you can see from these cards the secrets are well hidden. The language of ancient Hebrew is more accessible to us than Sanskrit, so we in the West have been very much more readily drawn to working with the Quabalah rather than sutras. Sound is very important in the process of creation and many of the words that we think of as names for things, angels, beings and Masters are not "names" as such. They are sound of formulas that invoke that particular energy. In ancient Hebrew they never wrote down the vowels because this was the invocation of the power of the word, thus it was kept secret so that only the initiated and wise could use it. When we say "Michael", especially if it has sounded in a particular way, we are actually vibrating the sphere of consciousness and thus the reality around us by a very precise formula. This formula has numerical correspondences as well as correspondences in levels of consciousness ( the sephiroth on the tree of life) and archetypes. Thus the quality of words that we use totally determines the energy that is created. The purer the sound the purer the manifestation. Thus to use the closest words that history has preserved for us enables us to invoke the clearest energy. The Ain, Ain Soph and Ain Soph Ur are words in ancient Hebrew that invoke the three primal motions (the Trinity) of creation. They are often shown as three half circles above the tree of life. The word Council in this case means had a collective consciousness. As you will see many of the words in the Angelic Attunement do not make sense in modern day usage. (For example renunciation, righteousness, mercy and archon). When we say these words in this attunement we are connecting into the highest meaning of this language and invoking the energy of Wisdom held in ancient Hebrew, brought by Moses out of Egypt, and held by Egypt after the fall of Atlantis. It is purist and most accessible lineage to the high wisdom of Atlantis. Yes I do teach Angelic Reiki, I work with Ann, we have not done any workshops for a while, People have not got the money. We were going to do a workshop October last year, 4 people had booked on, and at the last minute they all cancelled because they could not afford it. I did learn from that I do have to take deposits, I never do but will in future. Ann and myself spent a lot of time preparing for that workshop. I have been asked lots of times if we could teach it as 4 separate workshops, I personally think that would be better and more affordable at this time. This is a time when more and more people are exploring their spiritual pathway, and as much as they are very drawn to working and healing with the Angels, they do go for traditional Reiki because it is more affordable. It actually works out about the same but is spread out over 4 workshops instead of 2. We have offered to be paid in instalments, we do try to be accommodating. I advertise it in my newsletter and on my website, by putting fliers around. Most of the feedback is about the other work that I do. The enquiries that I do get about the Angelic Reiki, people are keen to do it but are put off by the price. To be honest I would not be able to do it now so I am very glad I did it when I did. I did ask Pauline about teaching 4 workshops instead of 2 and I had an email back from Yourself / Kevin or Maggie, (I am not sure who, Sorry,) saying that we could not do this because of the energies. Which is fair enough but I am sure a lot more people would become Angelic Reiki practitioners if we could do it this way. So maybe you’re in a position to take on board what I have said and maybe think about making these changes, I am sure that I am not the only one to think this. Thank you so much for getting back to me so quickly, I know you must be really busy. I know how long it takes, you log on to see if there are any emails, and answer those that are important and goodbye a good couple of hours / evening. Thank you for putting me on your emailing list. Thank you very much for your question it is an important one, so I'm sending the answer out to everyone. One of the important things about Angelic Reiki is for the participants of the workshop to sit in the energy for the amount of time that we recommend. The 1 & 2 workshop takes approxiametely two hours on the Friday evening, plus a full day on the Saturday and Sunday. During this time, for seven days before and seven days after, plus the period of time between the participants are committing (paying deposit) to the workshop, the necessary activations are taking place. They do not take place just during the attunements. The "initiation" into Angelic Reiki includes a change in the cellular and molecular spin and vibration of every molecule and atom within the physical, etheric, emotional, mental, and spiritual bodies. In 3-D this takes time. (To sit in this energy for seven days is one of the privileges gained by doing our seven-day workshop). The most potent part of these initiations starts as soon as the teacher opens up the workshop space on the Friday evening and continues until the workshop spaces is closed at the end of Sunday. This is what it takes to deeply integrate these attunements. Regarding abundance and number of people on workshops. Being attuned to Angelic Reiki Master is not a qualification in Angelic Reiki. It is an initiation into self Mastership and always has been in all forms of Reiki attunements. It is the invitation to take on board that we accept the path of learning that we are Masters of the 3-D world. There is at the moment a very powerful propaganda being put out by the few who wish to controller us on this planet. They have given it the name "credit crunch" and "recession". It is simply a campaign to anchor into our consciousness fear and powerlessness. We have a choice. We can embrace the power of light which is streaming onto our planet in the years coming up to 2012 and beyond or we can play the game of fear and victim. As it is so powerfully demonstrated in the film "The Secret" (which Kevin and I strongly recommend to everyone), just like the law of gravity, another law is that of attraction. That is how this universe works, we attract to ourselves what we think. It is a great challenge and at the same time it is a amazing opportunity. It is the path that we are all being invited to walk. During our journey through Kevin's cancer (or more accurately put “our cancer") we have been given a great spiritual kick up the arse to acknowledge this law and use it. We are all learning the disciplines of the Spiritual Warrior and it is the core of where humanity is at this moment. As well as recommending “The Secret", I also recommend Tom Kenyon's latest channelling. It is on the Angelic Reiki e-mail group website and of course on Tom's website. Our two other workshops, New Shamballa and The Golden Heart Merkabah of Creation are tools that Kevin and I offer to support this process. Embracing what we already know, and what we are powerfully learning every day, Kevin and I are going to present a new manifestation workshop from the 25th to the 27th of September. Come on let's rock 'n' roll and blast this reality into what we want. Love Peace and Power Always. I'm a newly qualified AR Master (trained with Shon East) I have a question that has been bugging me over the past few weeks. Not a very interesting one but one I would like to know the answer to all the same. The angel picture that you use for the advertising of AR I notice is the angel that appears in Leonardo's painting of Madonna on the Rocks - is there a significance there or is it something that you were just drawn to? Sorry if you have addressed this question before. It is actually a very interesting question. Because Leonardo da Vinci was an initiate into the societies of that day that knew the wisdom of sacred geometry all of his paintings are in Divine proportion. This means they emanate the energy unconditional love. This is something that we look at in-depth at part of the Merkabah workshop at it is the fundamental knowledge behind the power of the angelic kingdom. I have had an enquiry from a lady who will be 7 months pregnant at the time of my next attunement group. Is it OK to accept her or would it be wiser to wait til she's had the baby? I have been told, in other work that I do, that its not a good idea to do energy work that raises the vibration of the mother in the later stages of pregnancy or until about 6 months after the birth. I have never been told of any "contra indications' for the angelic reiki attunements thou but thought it best to check with you. It would be wonderful for her to receive the attunement 7 months pregnant. As she is enquiring about the class at this time it is probably an Indigo child that she is carrying and it would be a great gift for this child for the mother to receive the attunement and greatly ease its birth into 3D. This is one of the special and important purposes of Angelic Reiki. It creates a cellular, molecular, DNA and hormonal environment in the mother that is more in tune with the vibration of these new children being born mow.